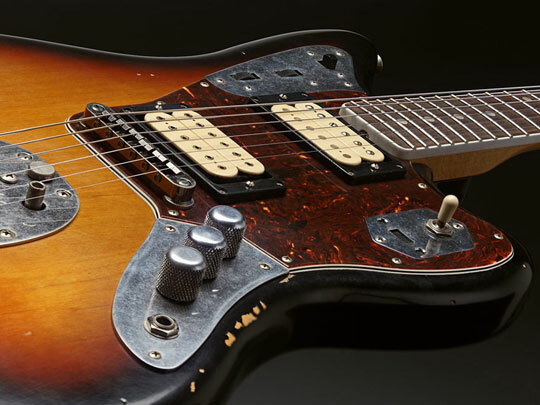 Fender will be introducing a ‘Kurt Cobain’ edition Jaguar guitar, marking the 20th anniversary of the iconic Nevermind album of Nirvana. The guitar is an exact replica of the original one that Cobain used, including its worn finish, dual humbucking pickups and unique electronics and controls. “Unique features include an alder body with Road Worn aged finish and hardware treatment, bound fretboard with pearloid dot markers, Stratocaster headstock shape with 1950s-style ’spaghetti’ logo under the finish, DiMarzio humbucking DP103 PAF 36th Anniversary neck pickup and DP100 Super Distortion bridge pickup, triple knurled ‘chrome-dome’ knob configuration (volume-volume-tone), three-position toggle switch, black chrome Adjusto-Matic bridge and Gotoh sealed tuners. The guitar will be available in right- and left-handed versions.